As you all already know, the off-the-shoulder style has been something I’ve invested heavily in this season. I think it is such a chic, flattering look. While off-the-shoulder may be a current trend, I find it to be a timeless look and believe I’ll be able to use these pieces year after year. This particular sweater is one I picked up during Shopbop’s big sale in November, and I ordered it in two colors. I decided to keep both and have worn them too many times to count! I love the tunic length of this sweater too – it’s awesome for throwing on over leggings and boots! This cashmere sweater is part of Shopbop’s Bop Basics collection of wardrobe staples and easy classics. The collection is very well made and is full of items every girl needs in her closet, like this simple white tank (on final sale for $16! ), this lightweight crewneck cashmere sweater, and this comfortable jersey leggings. Cashmere aside, most of the items are very reasonably priced! If you haven’t already, check it out! love your accessories, so pretty. Love this simple yet elegant look. I have yet to get on board with this trend but always love it on other people! LOVE your boots!! I think I need ’em! I need to get an off-the shoulder sweater! Yours is actually the perfect one, because of the fit. Also, I love your Celine!! Need this sweater! It’s so chic and versitile! I really need to get an off the shoulder sweater. This looks great on you and I love the leather OTK boots look. Gorgeous! Loving this off the shoulder look! And I agree…the tunic length is perfect with leggings and otk boots. off the shoulder pieces are totally my jam right now! love this look! the bag is a nice pop of color. perfect picture spot! those boots are perfection! So pretty! 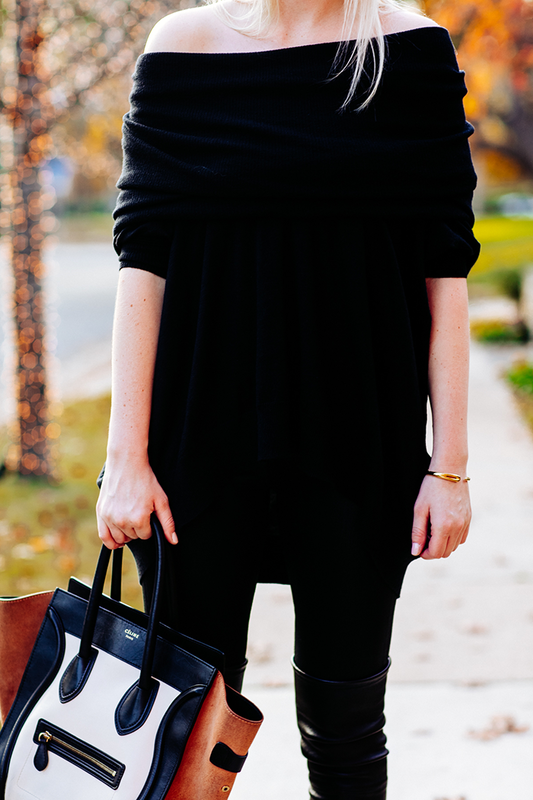 Just love this off the shoulder sweater on you! It looks like it was made for you! I have this sweater too! Looks great on you!